2 Uses to end a fist fight by striking a hammer-like blow on the top of the opponent's head. 1 Although Italian was his first language, he was dubbed for the Italian versions of most of the films he appeared in. This was due primarily to his strong Neapolitan accent, which was considered inappropriate for Westerns and action films. 4 He only dubbed himself (for the Italian versions) in these films: Flatfoot in Hong Kong (1975), Il soldato di ventura (1976), Piedone l'africano (1978), Piedone d'Egitto (1980), Occhio alla penna (1981), Fuochi d'artificio (1997), Cantando dietro i paraventi (2003) & Padre Speranza (2005). For his other films he was dubbed by Glauco Onorato (in 30 films), Sergio Fiorentini (in 4 films) and Ferruccio Amendola (in Today We Kill, Tomorrow We Die! (1968). 5 His 78th birthday on October 31st 2007 was greatly celebrated in Berlin with about 100 guests and a big Tiramisu pie. Bud Spencer was shooting for his new movie Killing Is My Business, Honey (2009) by Sebastian Niemann, starring Rick Kavanian, at this time in Berlin. German comedians Oliver Kalkofe and Oliver Welke (famous for the 'Wixxer' movies) announced themselves to take the chance to congratulate him personally. 6 Appeared in 18 films with frequent co-star Terence Hill, including the popular Trinity series of comedic Westerns. 8 Was personally recruited by former Italian Prime Minister Silvio Berlusconi to stand as a candidate of the moderate right-oriented party "Forza Italia" for the regional elections 2005 in Rome. He lost. 9 He's a Jet Airplane and Helicopter pilot (he became an flying geek after shooting All the Way Boys (1972)), and owned an air transports company. 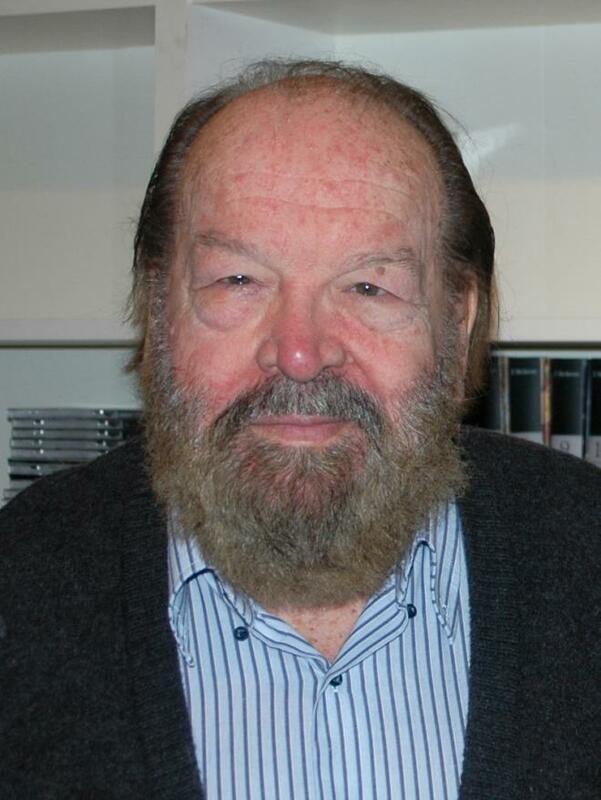 10 Carlo Pedersoli changed his name to Bud Spencer in 1967. He chose that name because he is a big fan of Spencer Tracy and because of his favorite American beer. 11 Children: Giuseppe Pedersoli (1961), Christine (1962) and Diamy Spencer (1972). 12 Competed for Italy in the swimming competition at the 1952 and 1956 Olympic Games. 13 Holds a Juris Doctor degree. Bud Spencer zu Gast im Ramada Hotel in Berlin 2016 Video documentary performer: "Futtetenne"
Bud Spencer - Die grosse Dokumentation 2013 Video documentary performer: "Futtetenne"
Io sto con gli ippopotami 1979 performer: "GRAU GRAU GRAU"
Lo chiamavano Bulldozer 1978 performer: "COMO SE LLAMA"
Turn the Other Cheek 1974 writer: "El Barco de San Jose"